Federal prosecutors yesterday urged the 9th U.S. Circuit Court of Appeals to permit a new trial of Nevada rancher Cliven Bundy, arguing in an extensive filing that a Nevada district judge overstepped when she dismissed an indictment against Bundy and his co-defendants — while also emphasizing that the rancher continues to unlawfully graze his cattle on public lands. In an 88-page opening brief, accompanied by more than 1,500 pages of court records and risk assessments about the Bundy family, the Justice Department decried Nevada Chief Judge Gloria Navarro's decision to declare a mistrial in December 2017 and to subsequently dismiss the case with prejudice, barring federal prosecutors from staging a retrial. Navarro ruled against the government after finding that federal prosecutors had withheld key information from defendants. "A universal sense of justice was violated by the government's failure to provide evidence that is potentially exculpatory," Navarro wrote in the July 2018 dismissal (Greenwire, July 5, 2018). But in its appeal, the Justice Department disputed Navarro's decision that prosecutors had acted maliciously, instead framing the disputed evidence as the result of a "chaotic" courtroom. "The prosecution team spent hundreds of hours reviewing documents with the goal of producing everything that was relevant or material, while at the same time avoiding a disorganized 'document dump'; meeting speedy trial obligations; and protecting witnesses, victims, and others from the very real possibility of threats and violence," DOJ Appellate Chief and Assistant U.S. Attorney Elizabeth White wrote. "Prosecutors kept a meticulous discovery index, documenting production of thousands of pieces of discovery," she added, pointing to the 1.4 terabytes of discovery in the trial. "Despite these diligent efforts, the results were not without error. But any errors were inadvertent, or at worst negligent, and thus ... they do not support the extreme sanction of dismissal with prejudice of the indictment." Instead, White argued that Navarro could have dismissed two counts of the 16-count indictment against Bundy and his co-defendants, or dismissed the case without prejudice, which would have forced the Justice Department to obtain a new indictment against the Nevada rancher. "Dismissal of one or more counts would be an extreme sanction, to be sure, but less drastic than dismissing the entire indictment with prejudice, and more appropriate," White wrote. Bundy, his sons Ammon and Ryan, and Montana resident Ryan Payne faced criminal charges stemming from a 2014 armed standoff with federal land managers who were attempting to round up Bundy's cattle for auction to satisfy more than $1 million in unpaid grazing fees and trespass fines. In their appeal, federal prosecutors also sought to place blame on Bundy, his sons and Payne and their respective defense attorneys for a "frenzied" courtroom atmosphere. "Defendants' accusations were also internally inconsistent, complaining about too little, and then too much, discovery — even within the same hearing," White wrote. She likewise criticized what she described as a "deluge of overlapping motions to dismiss, demonstrably untrue claims of withheld information, and contradictory accusations of misconduct" filed by defendants. "Despite the government's massive disclosures, defendants repeatedly made demands for discovery and then filed motions to dismiss alleging discovery violations when the government responded," White asserted. "In what became a familiar cycle, the district court would hold a hearing and conclude the government acted reasonably, but direct us to disclose additional information anyway. Our compliance would generate another round of Brady allegations and motions to dismiss, and the cycle repeated," she said, referring to the 1963 Supreme Court case Brady v. Maryland, which requires federal prosecutors to turn over exculpatory evidence to the defense. Defense attorney Larry Klayman, who is representing Bundy in the appeal and in a separate Nevada state lawsuit challenging government ownership of public lands, has previously called the Justice Department's request for a new trial an "outrage" (Greenwire, Dec. 26, 2018). In a response to White's filing yesterday, Bundy asked for the court to void the submissions, noting that federal prosecutors had missed an earlier filing deadline. Although White sought several extensions of time to file her opening brief, the court has yet to issue a ruling on the final request (Greenwire, Jan. 24). Klayman argued that the missed deadline means the prosecution's "pleading are void and of no force and effect and should be stricken." In a recent interview with Las Vegas CBS affiliate KLAS-TV, Bundy likewise dismissed the government's efforts to haul him back to court. "They're trying to force me into the picture here and get me to respond. Far as I'm concerned, it's not my problem, it's the judge's problem," he said. Bundy said he has not heard from federal land managers following the trial. But in its appeal, the Justice Department repeatedly emphasized Bundy's failure to pay grazing fees or trespass fines. 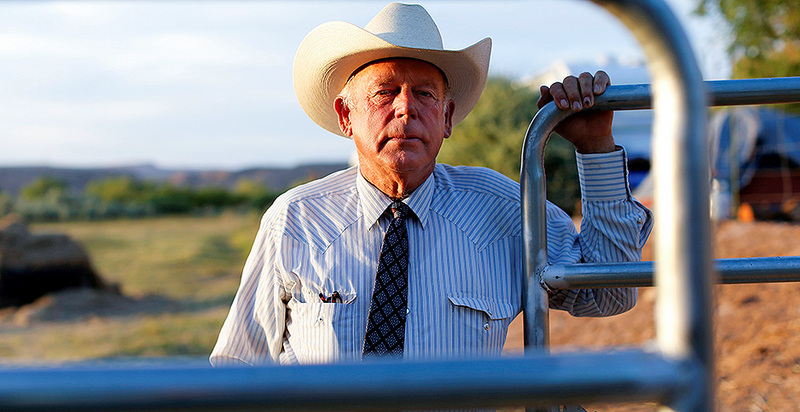 "The sound judgment of law enforcement kept the peace that day [in 2014], but the federal court's orders remain unenforced, and Bundy continues to unlawfully graze his cattle on federal land in violation of those orders," White noted in her opening brief.